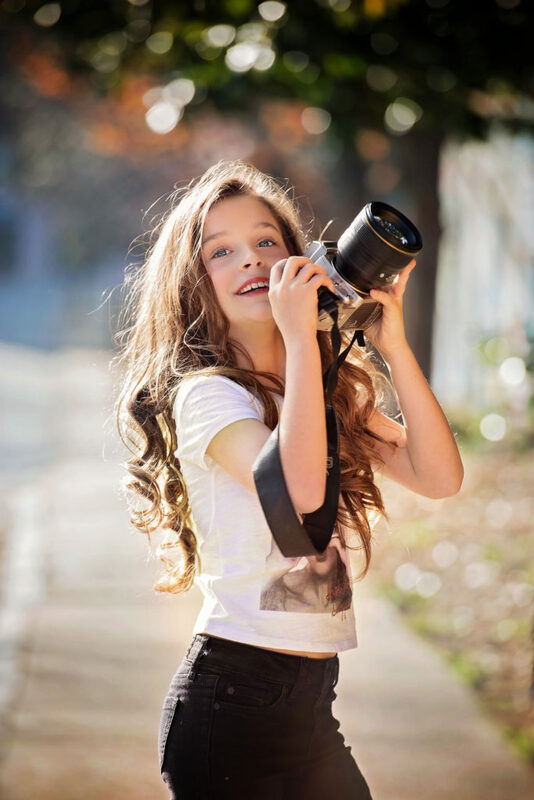 As a professional photographer in Alpharetta, I’m often asked by both parents and other professional photographers to share my best child photography tips. Parents want to know my secret for getting such great shots of their kids! Some of it has to do with my knowledge of the camera and the various lenses and settings, but that’s only part of it. I think child photography comes more naturally for some than others. There is a certain silliness involved that is tough to teach! However, over the years I’ve definitely learned my share of tricks for capturing those priceless expressions. Perhaps the one I rely on the most however, is this – make the child forget about the camera. Ask a child to smile for the camera – at best, you’ll get a big, forced, cheesy grin, and at worst, you’ll get a complete meltdown! You want the child to smile of course, but ideally it’s a natural smile, and that is unlikely to happen if all they can think about is the camera. So, I’m always trying to make them forget about it. I often do this with props – an unusual toy, flowers, or even an old-timey truck to climb on. Sometimes I’ll propose a location for its ability to distract, such as a creek or even a playground. Beyond props and a unique location, the very best way to distract a child from the camera is to make the sessions about something else entirely. I think one reason my spring sessions with farm animals result in such great images is because the kids don’t think of it as a photography session. They see it as a chance to pet and hold animals – and a lady with a camera just happens to be hanging around! They are usually so interested in the rabbit or duck or whatever it is we’ve introduced, that they completely forget about the camera. Their natural expressions of delight and wonderment sum up everything I love about child photography. The farm animal sessions work well with kids of all ages, but for girls aged around 6-12, styled sessions offer another way to transform the session into a fun experience. The girls can choose from a selection of couture gowns that will instantly make them feel like a princess – twirling in a meadow and smelling the flowers. These sessions are always memorable and result in some gorgeous – and truly unique – images. 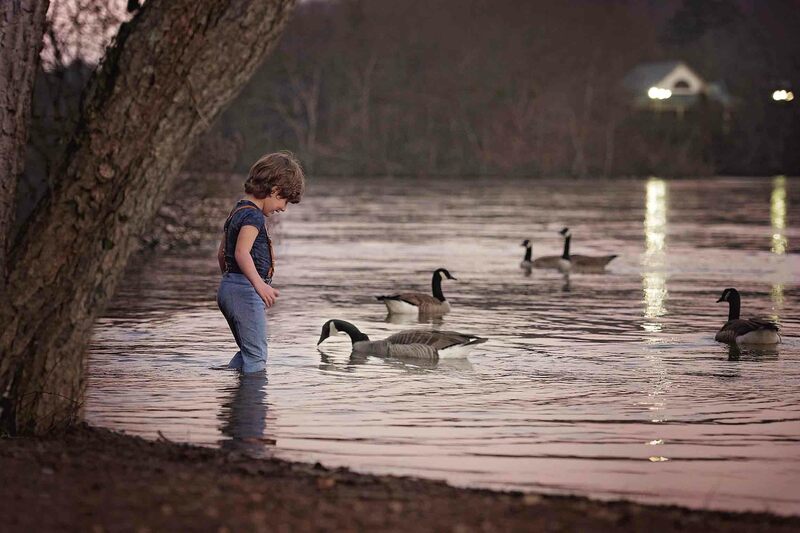 I realize these tips – using animals or expensive gowns to capture great images of your kids – might not be easily transferable to parents, but hopefully the purpose behind them is clear. Whether you are holding a little photo session of your own or are simply trying to snap a few pics after the soccer game, try to provide a distraction to make it less about the camera. For example, try saying, “Show me your medal,” instead of “Look here and say cheese!” Or just take your camera out back to the swingset instead of having them pose on the front steps. In my experience, it’s easier to capture those natural expressions when a child is doing something rather than just posing. They will enjoy it more and you will get better images. Win-win! Jennifer McCarren of Freckled Flower Photography specializes in newborn, child photography and family photography in North Atlanta, Georgia locations such as Alpharetta, Milton, Roswell, Dunwoody, Sandy Springs, Marietta and Canton. Freckled Flower Photography is a proud member of Professional Photographers of America. Freckled Flower Photography has been featured more than once on Beyond the Wanderlust, Mozi Magazine, Inspire- Digital or Not Fine Art Photography Magazine, Photo Artistry, Pretty Forum and many others. I’ve also been published in CHIC Critique Magazine: The Vintage Issue, Young Kids Fashion Magazine, Child Model Magazine http://www.imtherealthing.com and Petite Magnifique Magazine. Contact me here to request more information about a North Atlanta Newborn Photography session, or you can follow me on Facebook, Instagram, and Pinterest, where I announce special offers and share my favorite images from recent photo sessions. I’d love to send you my newsletter as well – scroll up to enter your email address on the left. 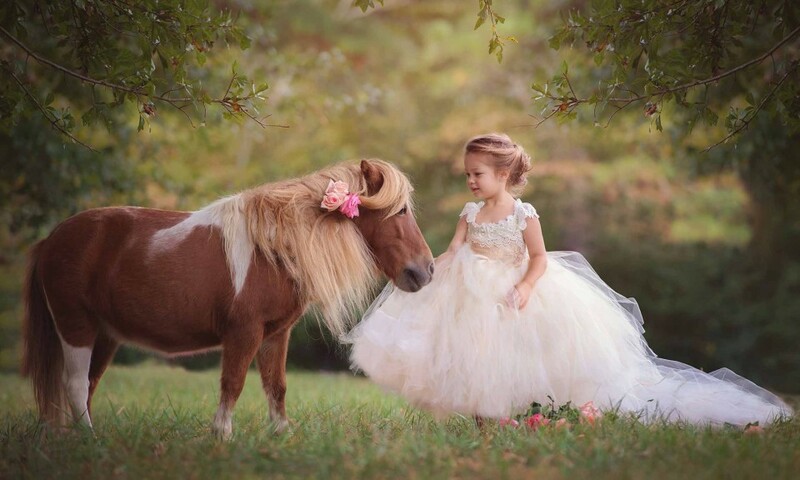 This entry was posted in kiddos, photography tips, styled, Uncategorized and tagged Child Photography, child photography tips, child photography with animals, child portraits, Freckled Flower Photography, photography with animals, styled child.